Watching his six-month-old daughter endlessly spasming in pain drove Michael Lambert beyond the bounds of Australian drug laws. Three years later, Katelyn's recovery has prompted an unprecedented A$33.7 million (NZ$37.29m) donation to fund research into medicinal cannabis. The three-year-old's grandparents made the staggering donation on Friday to scientists and the University of Sydney - the largest donation ever made to any Australian university. It was some consolation for Barry and Joy Lambert, whose BRW rich-list credentials were powerless to ease their granddaughter's pain. "When you get to the end of the road you try desperate measures," Joy Lambert said at the University of Sydney. "I never imagined she would be able to go to preschool," she said. Katelyn's father Michael still cries when he thinks about the day his daughter was diagnosed with Dravet Syndrome. "I said to the doctor 'don't tell my wife until you know for sure', because she's never going to be all right." Katelyn had a one in two chance of dying before she was 18 years old and a 100 per cent chance of intellectual disability. Some days Katelyn had more than 1000 seizures: one every 15 seconds. "They were terrible. She was getting electrocuted to death," Lambert said. The thought of her tiny body writhing under the effects of one of the most vicious forms of childhood epilepsy propelled him to act. "I thought, 'how the hell do you stop this?' Then I heard about Charlotte Figi," Michael said. 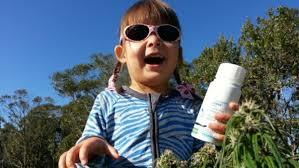 Charlotte was a US toddler with Dravets whose seizures decreased dramatically after she was given a strain of cannabis called CBD. "This girl went from a dribbling, jerking mess to a girl who only had a seizure a couple of times a month," he said. He ordered the cannabis oil online. It arrived in the post and he gave it to his daughter straight away. "The next day, I'm not kidding you she just woke up. It wasn't like she was looking through a storm of noise and static, she just looked normal. She stopped jerking. She got so much better straight away," he said. The state government created in December a register for terminally-ill users of medical marijuana. Police have the discretion to not charge them for possessing small amounts of the drug. "Anecdotally I believe it works, but scientifically we just don't know yet," he said. Katelyn's father hopes that his parents' donation will propel research into cannabinoids and inform clinical practice. "Now they've got steady funding ... they can study the plant systematically instead of haphazardly testing one strand at a time," he said. University of Sydney psychopharmacology professor Iain McGregor said the research will focus on 10 key cannabinoid compounds found in marijuana and their potential use to treat a range of illnesses, including childhood epilepsy. "Only one [THC] is psychoactive," Professor McGregor said. "This gift will allow us to explore one of the most exciting questions in modern medicine. "The new science of cannabinoids has incredible potential for relief of human suffering ... and to repair damaged bodies and brains." Pre-clinical research in Sydney has found one of marijuana's compounds improves memory in mice with Alzheimers-like symptoms. Researchers say only about 10 of its roughly 100 compounds are sufficiently well known for trials to be feasible. The scientific potential of the others remains unexplored. Professor McGregor said the centre could grow its own cannabis for the research under licence from the state's chief pharmacist and will also seek to synthesise cannabis compounds in a laboratory.